P.S. I'm going to take more pictures of it soon...I swear. This June gloom that's come over the South Bay just needs to end so I can give it a good wash and I need a day off of work so I can go take a drive and take pictures of my wee little friend. It´s my absolute favorite shade of yellow. We planned to change car anyway and when the community care service for sick seniors living at home got 6 red Yaris we decided to get another color. 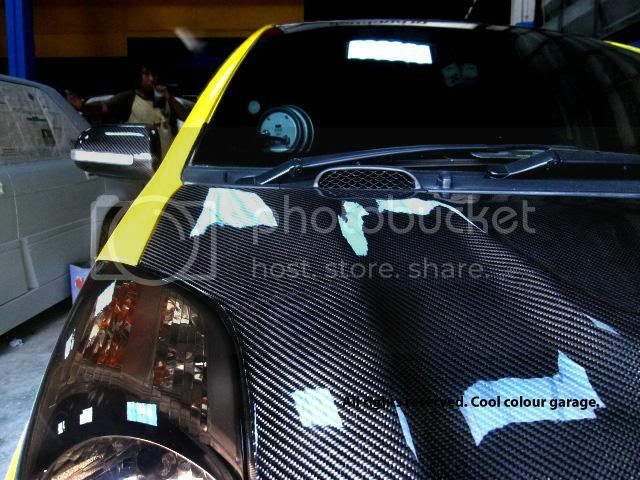 It´s our 4th new yaris since 2003 and there will be more of them (or the next version). Most swedes are very boring, almost all choosing paint work between silver and black. They call it sofisticated, I call it dull. I worked at the SAAB plant in Trollhattan in the eighties and it was very hard to se if a steel paint support rack was covered in gray metallic paint or sand blasted metal clean with a little clearcoat on it. For me those non colored paint works are like no paint at all. just wanted to mention i saw one irl a couple days ago. I don't know what everyone was complaining about, the thing looked bright yellow to me. A great color. Welcome to the forums and congratulations on the purchase! Last edited by DeathBeard; 12-01-2012 at 10:01 AM. awesome, love the wheels and the spoiler. I sure wish they had a Yellow when I got my 2013 - Or a Green for that matter...BUT, If they had a bigger choice of colors, I would have been up s**t creek w/o a paddle trying to make that decision! Really, really like this car, you would never know by this photo that is has 183,000 miles on it...that's unreal. Just rolled 233,000 miles... getting ready to revamp the whole front end with a Yaris S spoiler and Xpel or 3m clear bra by the spring. Driving without one has resulted in my front end looking like I was behind a guy firing a shotgun!?! I've recently started trolling around Yarisworld again after a very long hiatus. Was reading my old posts and was reminded about the unfortunate demise of my beautiful little yellow jolt S that came to me straight from Japan. 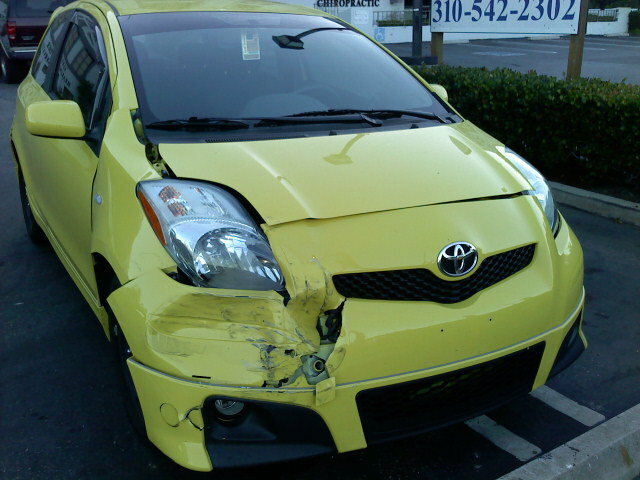 It was totaled in an accident in mid-2010 where another driver rear ended me on the freeway (traffic had come to a sudden stop and they were still going pretty fast) and pushed me into the car in front of me. 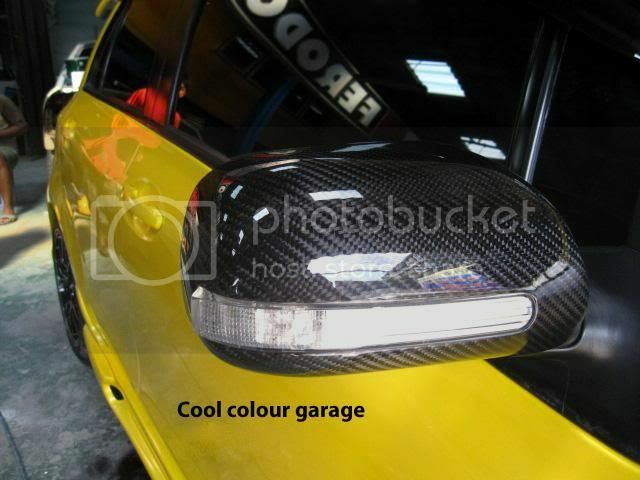 Can't find a picture of the back end right now, but the car was pretty effed up. So now I have a 2011 Yaris S 3-dr 5-speed manual in absolutely red. It's been good to me and will be turning over to 100k miles in the next month or so. My first Yaris was a bit of an odd ball when I think back on it now. 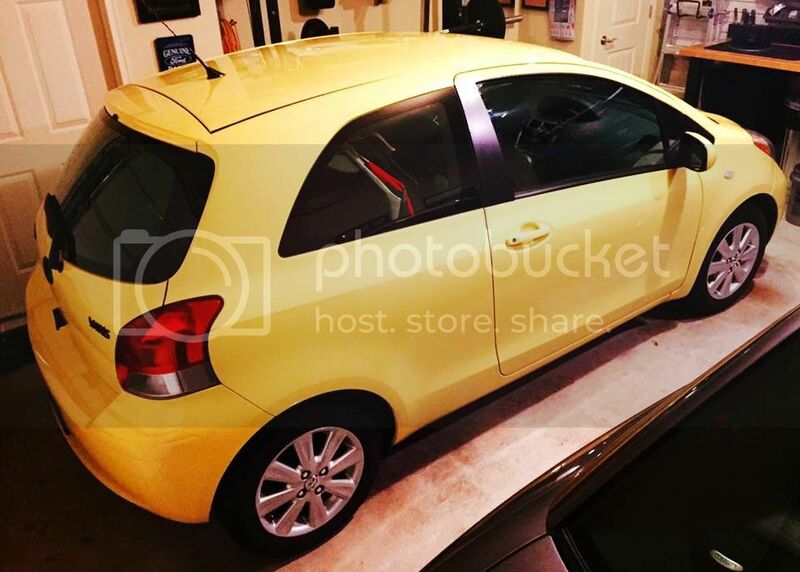 The yellow color/S combination that was supposedly super rare (I've never seen another one like it) plus the fact that when I ordered it, somehow the power package was left out, so it came completely manual everything....manual side mirrors, hand crank windows, the weird non-60/40 back bench seat. I was pissed at first about that, but got over it pretty quickly because of how funny it was when people would get into my brand new car and puzzle over the crank windows. It also had a 5-speed manual transmission. That car was a hilarious anomaly. I miss it. 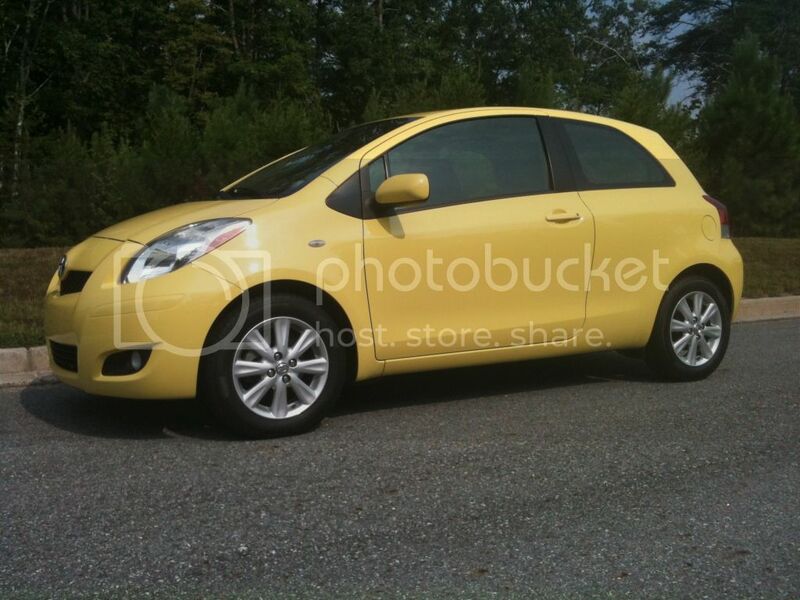 If I ever have to get my current Yaris repainted for whatever reason, I'm definitely painting it yellow. 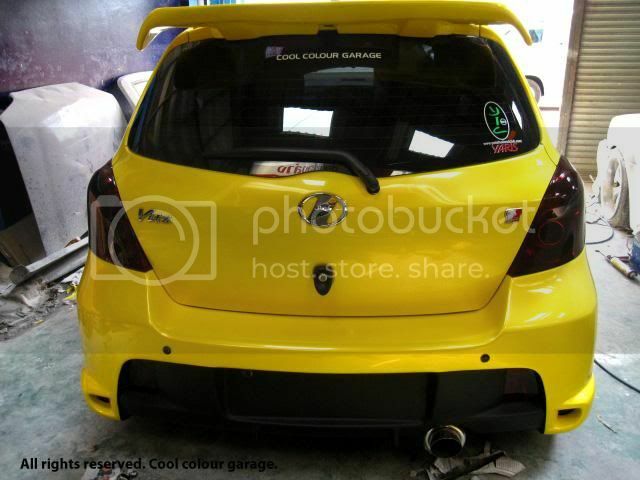 Long live the yellow yaris! 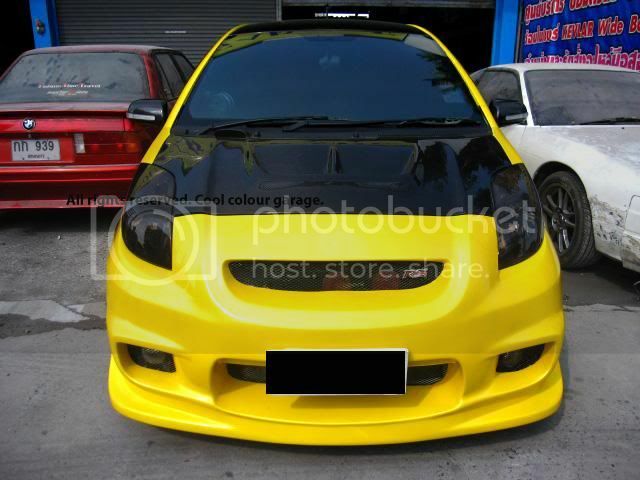 Interesting front bumper/lip combo on the yellow.